The Harvest Moon is coming this weekend! The moon has been waxing larger each night, and full moon is the night of September 29th-30th, 2012. In traditional skylore, the Harvest Moon is the full moon closest to the autumnal equinox. For us in the Northern Hemisphere, the Autumnal equinox came on September 22nd. That makes the September 29-30 full moon the Harvest Moon. 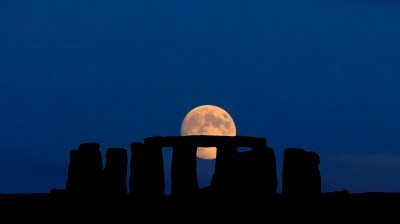 Situated on the edge of Salisbury Plain, the prehistoric ceremonial landscape of Stonehenge occupies a large, sparsely populated area of ancient downland ideal for observing the Harvest Moon. The Harvest Moon is coming! Harvest Moon is the full moon closest to the autumn equinox. It’s the full moon of September 29th-30th . So don’t just look for the Harvest Moon on the night of September 29 or 30. Look for the moon to be bright and full-looking for several nights at the end of September, 2012. If you live far enough north – for example, in the northern states, Canada or Alaska – the Harvest Moon will continue to shine from dusk until dawn into early October. This procession of moonlit nights is what characterizes the Harvest Moon. Why is the Harvest Moon special? Harvest Moon is just a name. It’s the name for the full moon nearest the autumnal equinox. In the Northern Hemisphere, you’ll always see the Harvest Moon in either September or October. In the Southern Hemisphere, a moon with these same characteristics always comes in March or April. But the Harvest Moon is more. Nature is particularly cooperative around the time of the autumn equinox to make the full moonrises unique around this time. Here’s what happens. On average, the moon rises about 50 minutes later each day. But when a full moon happens close to the autumnal equinox, the moon (at mid-temperate latitudes) rises only about 30 minutes later daily for several days before and after the full Harvest moon. Why? The reason is that the ecliptic – or the moon’s orbital path – makes a narrow angle with the evening horizon around the time of the autumn equinox. The narrow angle of the ecliptic results in a shorter-than-usual rising time between successive moonrises around the full Harvest Moon. These early evening moonrises are what make every Harvest Moon special. Every full moon rises around sunset. After the full Harvest Moon, you’ll see the moon ascending in the east relatively soon after sunset for several days in a row at northerly latitudes. The lag time between successive moonrises shrinks to a yearly minimum, as described in the paragraph above. Because of this, it seems as if there are several full moons – for several nights in a row – around the time of the Harvest Moon. Is the Harvest Moon bigger, or brighter or more colorful? Not necessarily, but the actual size of the Harvest Moon depends on the year. The Harvest Moon has the reputation of being especially big and bright and orange. But it isn’t really the Harvest Moon’s size or brightness that distinguishes it from other full moons. In fact, the 2012 Harvest Moon is a touch smaller than an average-sized full moon. Still, you might think otherwise. That’s because the Harvest Moon has such a powerful mystique. Many people look for it shortly after sunset around the time of full moon. After sunset around any full moon, the moon will always be near the horizon. It’ll just have risen. It’s the location of the moon near the horizon that causes the Harvest Moon – or any full moon – to look big and orange in color. The orange color of a moon near the horizon is a true physical effect. It stems from the fact that – when you look toward the horizon – you are looking through a greater thickness of Earth’s atmosphere than when you gaze up and overhead. The atmosphere scatters blue light – that’s why the sky looks blue. The greater thickness of atmosphere in the direction of a horizon scatters blue light most effectively, but it lets red light pass through to your eyes. So a moon near the horizon takes on a yellow or orange or reddish hue. The bigger-than-usual size of a moon seen near the horizon is something else entirely. It’s a trick that your eyes are playing – an illusion – called the Moon Illusion. You can lengthy explanations of the Moon Illusion by googling those words yourself. So why is this moon – the moon closest to the autumnal equinox – called the Harvest Moon? The shorter-than-usual time between moonrises around the full Harvest Moon means no long period of darkness between sunset and moonrise for days in succession. In the days before tractor lights, the lamp of the Harvest Moon helped farmers to gather their crops, despite the diminishing daylight hours. As the sun’s light faded in the west, the moon would soon rise in the east to illuminate the fields throughout the night. Who named the Harvest Moon? That name probably sprang to the lips of farmers throughout the Northern Hemisphere, on autumn evenings, as the Harvest Moon aided in bringing in the crops. The name was popularized in the early 20th century by the song below. Bottom line: The Harvest Moon will come in late September in 2012. The Harvest Moon is the full moon closest to the autumnal equinox, which in 2012 comes on September 22. So the full moon of September 29-30 is 2012′s Harvest Moon. October 1 will have a beautiful bright full-looking moon, too. The Harvest Moon is not really bigger, brighter or more pumpkin-colored than other full moons, but it’s special because, at this time of year in the Northern Hemisphere, the time between successive moonrises is shorter than usual. Enjoy………….